Though the Lego-esque appearance of these ties might not appeal to everyone, they are undoubtedly a marvel of 3D printing technology. Massachusetts-based company 3DTie has recently released a small collection of neckties and other accessories, all made using an Ultimaker 2 3D printer. 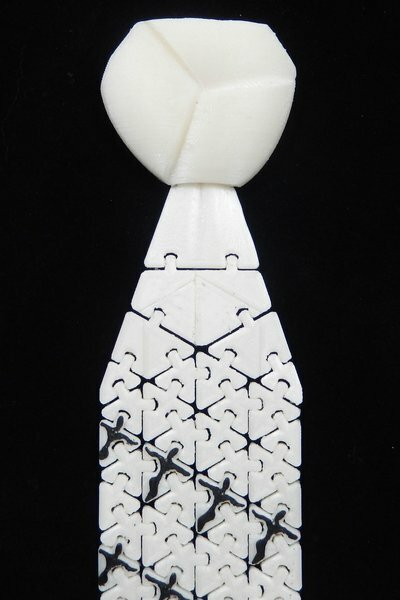 3D printers are not yet capable of printing ‘fabric’ in a traditional sense, so it required some ingenuity on the part of software architect Boris Rabinovich to create a flexible material that could be used for a necktie. The result is a series of interlocking plastic pieces that give the tie a fluid, fabric-like look. The ties bend and fold and can even be rolled up for storage. The most interesting element of these 3D ties is how customizable they are. Most ties come with a ‘Windsor’ knot, but this can be exchanged for a ‘Trinity’ knot. There is also a special ‘Holey’ knot which can be attached to any blade (the body of the tie); the company offers a number of chips or inserts which can be placed into the Holey knot to add another level of customizability to the tie. 3DTie offers both skinny and standard width ties ranging in price from $140-$200. Accessories and interchangeable knots are available for extra.